The upcoming Skoda Kamiq seems to promise a fresh and aggressive design while retaining some of the signature Skoda styling bits. 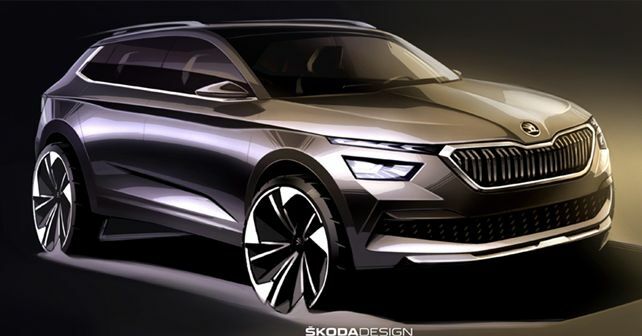 Ahead of its global debut at the 2019 Geneva Motor Show, Skoda has gone on to reveal the official design sketches of its upcoming SUV – the Kamiq. The Kamiq will be Skoda's third offering in its SUV lineup and will be positioned below the Kodiaq and the Karoq. Based on the design sketches, the Kamiq retains quite a lot of signature Skoda styling elements, most noticeable in the double-slat upright radiator grille and the mid-rib sculpted bonnet. Skoda has been putting the 'City SUV' tag on the Kamiq, which is reinforced by the SUV's high ground clearance and its overall rugged, off-look appeal. The front fascia has been made bolder with the use of a silver-coloured front spoiler. On the other end though, the Kamiq will be the first Skoda model to feature split-headlamps, which are based on a two-part LED headlamp design. The LED DRL strips, which will double up as dynamic indicators, have been positioned above the main headlight unit. While this design may be a first for Skoda, it will certainly not be new to folks in India, as the Tata Harrier already features this design layout on its front fascia. At the rear, the Kamiq follows Skoda's new design philosophy with the 'SKODA' lettering spread on the tailgate, replacing the iconic Skoda badge. Further, the C-shaped taillight design makes the rear styling in sync with the front, and a chunky cladding on the lower end of the bumper encases the exhaust openings on either side. While the Kamiq's global debut will take place at the 2019 Geneva Motor Show, it is most likely to make its India debut at the 2020 Auto Expo.